Since my childhood days, I have been a fierce and stubborn individual, always functioning under the belief that I know everything there is to know. I do not like constructive criticism and I certainly do not like unsolicited advice. Hence when I went into Markhor ’16, I went in with a pretty strong belief that I was the best person there. Unfortunately (or fortunately), all these assumptions of mine were shattered during this journey, and made me a better person for it. I met the kind of people I could never have imagined getting the chance to cross paths with; individuals of different cultures, ethnicities, castes and territories; people who spoke different regional languages, possessing a mindset which differs from mine in every possibly manner. 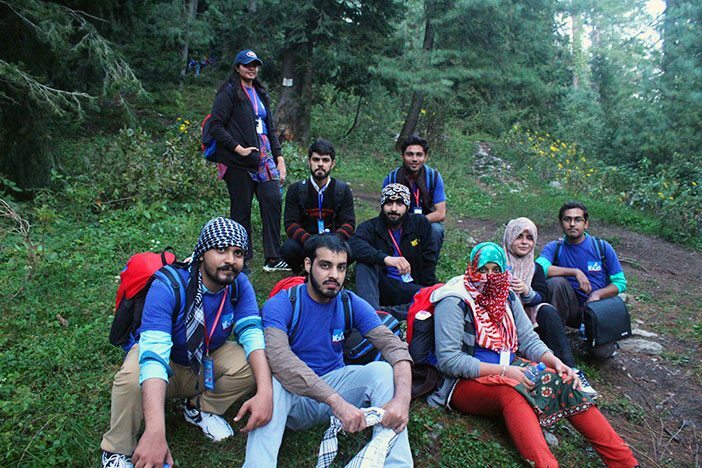 Markhor is Pakistan’s first wilderness based leadership program conducted by Youth Impact. This year, on 25th September, me along with 85 others, were chosen out of 3500 participants to climb the Mukshpuri top. After arriving at the Islamabad Youth Hostel, my fellow tribes(wo)men and I were taken to IBEX club. We climbed aboard our coach and began our journey to the Mukshpuri Hotel, approximately three hours from Islamabad. Markhor ’16 brought together individuals from 42 universities all over the country. With there being 86 of us, we were divided into 10 tribes. These tribes embodied certain values, namely Altruism, Compassion, Empathy, Forgiveness, Selflessness, Responsibility, Positivity, Giving, Impact, and Creativity. Each tribe, in turn, was headed by a ‘shepherd’; the tribes(wo)men in each tribe were handpicked to ensure cultural diversity, so my tribespeople varied by provinces and territories. I was part of tribe Responsibility. Before the opening ceremony of Markhor’16, my tribe’s shepherd gathered all eight of us (the tribe members, then strangers to each other) together and told us that for the next four days, our tribe would be our family. At that point, none of us really understood the gravity behind his words. The next four days were going to change me forever. Not only did they instill all the values of the tribes in me, they allowed me to conquer feats I previously saw as hindrances. I broke a stereotype I had been fighting against all my life and climbed to a height of 9,240 feet with layers that were considered to be a barrier between a woman and adventure. I could never have done this on my own; were it not for the support from my tribe and the encouragement from my shepherd, I would not be the person I am today. Once each person was virtually tied to their respective tribe, you were not allowed to eat, sleep, walk, hike, sit and play without your ‘family’. Even to respond to the call of nature one had to take at least two tribemates as bodyguards. I was the slowest during the hike due to lack of stamina, my heavy rucksack, and most of all, my hijab and abaya which made it all an even bigger challenge. But my family, my tribe members, figured out ways to help me: seven people, who were complete strangers to me, showed empathy and compassion. One took the responsibility of my rucksack; the other bucked me up with patriotic songs. My female tribe members constantly assured me that I was not being a burden on the whole tribe, and together as a family we hiked. That is how I accomplished a task that was impossible. Markhor’16 made the impossible, possible for me. It gave me another family. Markhor’16 invited guest speakers to the Mukshpuri top, who bestowed us with outdoor lectures on the subjects of leadership, entrepreneurship, financial asset management, and training on storytelling for change. Professional ethics like team work, resource management, time management and planning were taught through physical games supervised by Chief Executives of organizations like Multinet, Entrepreneurial Alliance and ICICI. They provided everyone with [—less] advice. Sessions like ‘Social Diwan’ helped tribes connect with one another by presenting skits in front of a bonfire, whereas sessions like ‘Freedom Bell’ helped people connect with themselves and to reflect on the purpose and aspirations of their own life. Markhor gave me the chance to learn and be inspired through the stories of our youth. Pakistan’s youngest chef and world’s first female to cycle on a glacier talked to us about their aspirations and motivations. I also got a chance to meet an Army Public School (APS), Peshawar attack survivor, which truly humbled me and made me appreciate the life I lead. This wilderness based leadership program was a full-fledged experience for everyone. No one wanted to come back to the rush of city life. This lasting impression aimed to instill basic leadership qualities among individuals who will influence the future of Pakistan. I can honestly say, from my experience, that it changed me into someone who will have a much brighter, more inclusive, and all-round happier future thanks to the things I learned. This blog was written by Mehak Irshad, Freshman at HU’s School of Arts, Humanities & Social Sciences, majoring in Communication Studies & Design (CSD), Class of 2020.